NYPL's Gray Studios cabinet of Charlie Ferguson. -When the New York Public Library published its original inventory of the famous A. G. Spalding Baseball Collection in 1922, it accounted for forty-five cabinet cards of Harry Wright’s Philadelphia Nationals shot by Boston photographer, Gray Studio. Today, only forty-three remain in the collection with two examples believed to be missing as a result of a 1970s heist from the library. The Gray Studio cabinets are considered proofs for the famous N173 Old Judge cabinet cards issued by the Goodwin and Co. tobacco firm between 1888 and 1889. There are very few Gray Studio cabinets in private hands and virtually none of Wright’s Phillies. 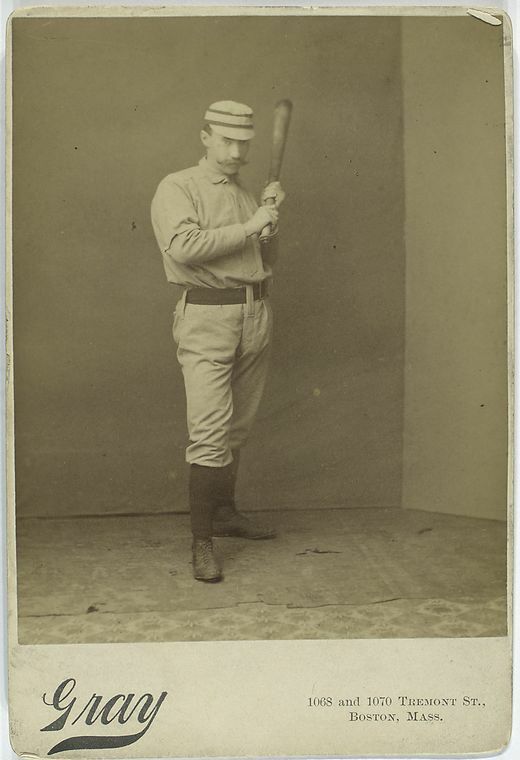 Last month, after already helping recover a photo stolen from the Boston Public Library, Iowa collector David Maus noticed a Gray Studio cabinet card of Philadelphia’s Charlie Ferguson being sold on eBay and reported it to Haulsofshame.com. The card offered on eBay had no visible library ownership stamp but did have visible paper loss on the reverse. It also had the identical numerals “1662″ written in pencil on the reverse, matching the NYPL’s other copy featuring the same pose of Ferguson. The Spalding Collection includes duplicates of many cabinet cards that are part of the Harry Wright archive. Over one hundred photographs are currently missing from the collection and items since recovered by the FBI show that the thieves and/or collectors have bleached out, erased or defaced the identifying library ownership marks. -A source familiar with the NYPL investigation indicated that after the library was notified of the sale the FBI became involved with the eBay seller who had already received a winning bid of close to $1,000. -What are the odds this card isn’t from the NYPL collection? What’s the real story here? -In Lelands’ current auction another item suspected to have been stolen from the NYPL’s Spalding Collection is being offered for sale. It’s a c.1870s envelope addressed to Harry Wright and featuring handwritten notes of the Hall-of-Famer on its reverse. In the 1970s, three large volumes of Harry Wright’s correspondence were stolen from the NYPL and it is estimated that those volumes contained between 1,000 to 1,500 documents including incoming letters to Wright, outgoing drafts of letters written by Wright, post cards, telegrams, financial documents, contracts, stockholder information, invitations, expense reports and other assorted ephemera. Leland's is offering this suspect envelope addressed to Harry Wright in their current auction. Haulsofshame.com contacted Lelands CEO Josh Evans last month when the item first appeared online. Lelands says the envelope was, ”recently discovered at a philatelic show,” but had no additional information about the document’s provenance. 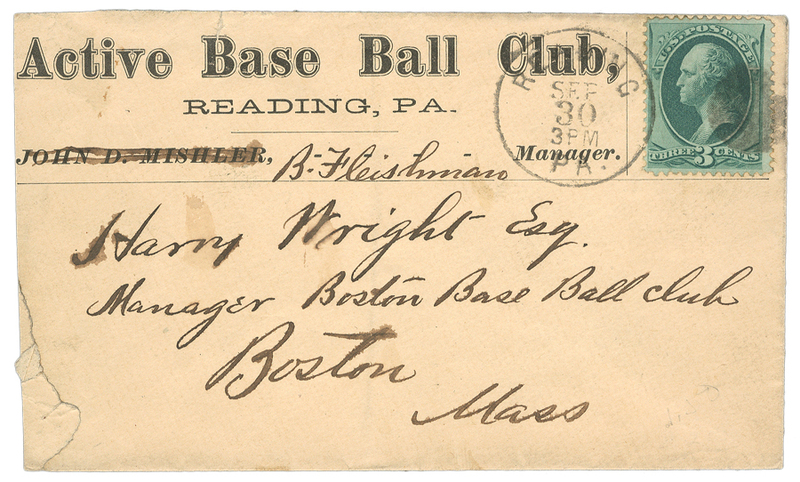 -Harry Wright’s outgoing letter-press correspondence volumes at the NYPL indicate that the Lelands envelope once housed a response from the Active Base Ball Club to a letter written by Wright in the early 1870s (That letter was likely once part of Wright Correspondence Vol. 1). With so many documents verified as missing from the NYPL’s collection of Wright correspondence, the Leland’s envelope offering is highly suspicious. In fact, the writing on the reverse of the envelope in Wright’s own hand documents expenses for his club on a trip to Providence and it has already been proven that other documents tallying expenses were part of Harry Wright Correspondence Scrapbook Vol. 1 in the NYPL collection. 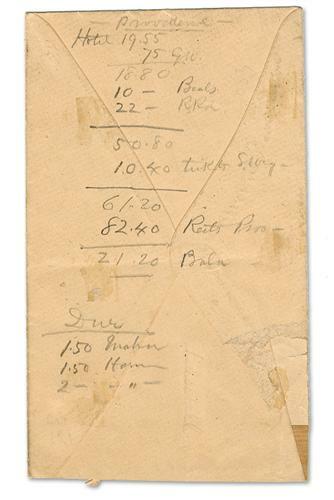 The reverse of the envelope offered by Lelands features handwritten accounting notes in Harry Wright's hand. 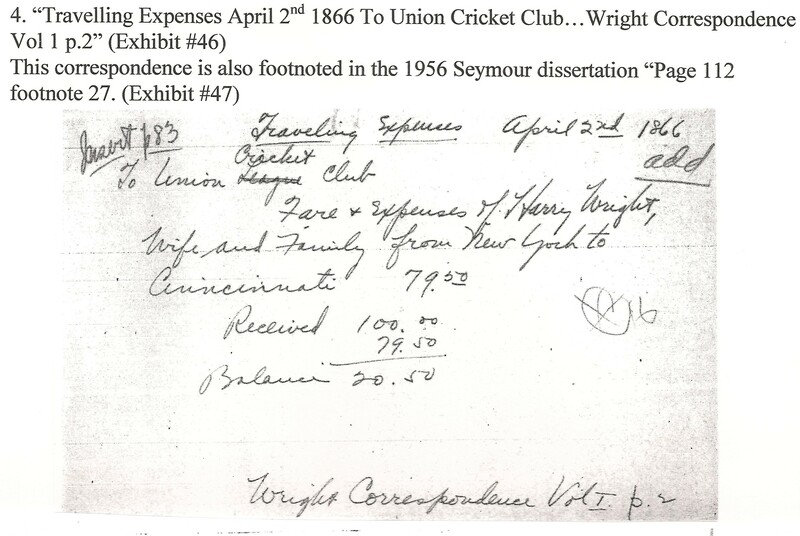 A similar document from 1866 listing Wright’s expenses for a trip to Cincinnati was stolen along with the entire Volume 1 and offered for sale in the baseball collectibles market in the 1990s. The document was further identified definitively as NYPL property when the very same document was footnoted in works by Harold Seymour and Dorothy Seymour Mills in the 1950s and 1960s. The original Seymour research notes housed at Cornell University show that this document was pasted precisely to “page two” of Wright Correspondence Volume 1. Examining Harry Wright’s Scrapbook Volume 2, which is still housed at the NYPL, it is clear that it was not Wright’s normal practice to retain envelopes along with correspondence sent to him between 1878 to 1884. It is possible this envelope may have been retained by Wright because of the financial information written on the reverse. The Spalding Collection also features Harry Wright’s “Note and Account Books” spanning the years 1860 to 1892. The NYPL had eighteen volumes when they conducted their inventory in 1922. Currently three volumes are missing from the collection. It is also possible that the Lelands envelope could have originated from one of Wright’s accounting books. Considering the volume of missing items from the Wright archive, when a Wright-related item is offered for sale and the seller can’t provide sufficient information regarding the items provenance, there will always be doubt as to whether the item is legitimate or stolen from the NYPL. -Lelands’ Wright envelope being offered as lot 235 in their current auction has only received one bid for $300. This original research note housed at Cornell Univ. documents that an 1866 expense document (similar to the one offered at Lelands) was once part of NYPL's Wright Correspondence Scrapbook Vol. 1 on "page 2." -The upcoming July 4th weekend will mark the 2-year anniversary of the commencement of the FBI investigation into the thefts of the Harry Wright scrapbooks from the NYPL. -James Cummins Booksellers of New York City is currently offering yet another item believed to have been stolen from the NYPL’s Spalding Collection; a Constitution and Playing Rules of the Eastern League from 1886. The bookseller is asking $1,000 for the scarce booklet. This 1886 Constitution and Rules for the Eastern League was once part of the NYPL's A.G. Spalding Collection. It's currently being offered for sale by James Cummins Booksellers in NYC. The pamphlet still features the original NYPL call numbers, “MVFB p.v. 58, no. 6″ written on its cover page along with an library stamp which reads “34197A.” The entry for the pamphlet in the 1922 NYPL official Spalding Collection inventory matches the call numbers on the item for sale by James Cummins Booksellers. 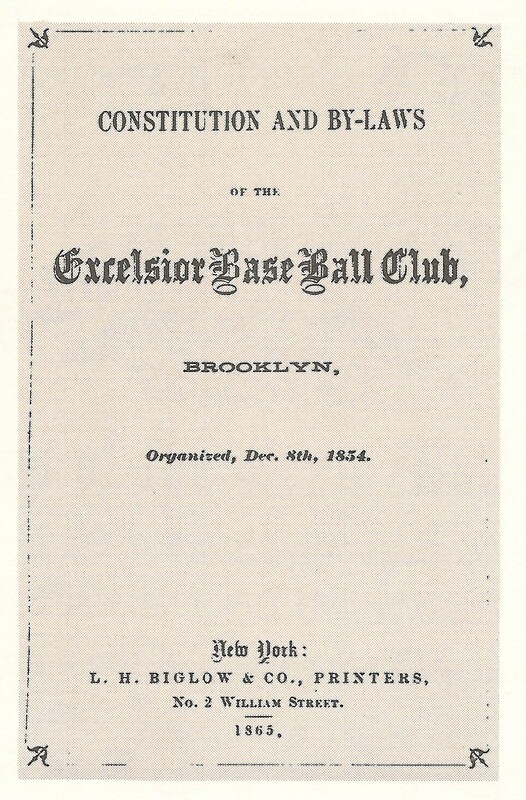 The 1886 Eastern League pamphlet was documented in the original 1922 NYPL Spalding Collection inventory (above). -In the 1980s some duplicate pamphlets from the Spalding Collection were deaccessioned and sold to book dealers after they were microfilmed. (Many of the duplicates were of Spalding’s Annual Baseball Guides.) 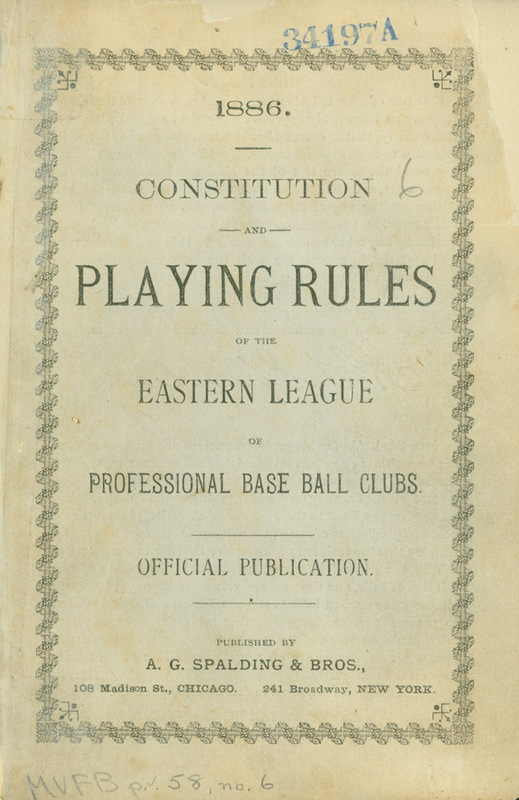 The 1886 Eastern League constitution was not a duplicate (as indicated on the original 1922 NYPL inventory) and is currently missing from the Spalding Collection. This 1865 Constitution and By-Laws of the Excelsior BBC is currently missing from the NYPL collection. Sources indicate that several other rare and valuable Constitutions and By-Laws of baseball’s earliest and most prominent teams have been stolen from the library. One example is the 1865 Constitution and By-Laws of the Excelsior Base Ball Club of Brooklyn. The pamphlet was reproduced in Irving Leitner’s 1972 book, Baseball: Diamond in the Rough, but is currently missing from the Spalding Collection. Its value is estimated between $25,000 to $50,000. I think every well-meaning man or woman that visits this site, and cares earnestly about the protection of these treasures, should artificially and maiciously bid-up any of these items, when they appear in auction anywhere, for the purpose of making them unsellable! They are, in fact, priceless; they should remain so. It is very true, that just maybe some of these were found in someones attic or shoe box from whenever, but due to the fact that there is no one around to attest to the fact of this or any other reason why and in view of the fact that there have been many items surfacing from the Halper collection recently that were stolen,hummmmm, makes you wonder that just maybe where it came from. ????????? ?